Not the side I ended up using. “More colah! brightah colah!” was the refrain of one of the printmaking professors at my undergrad program (hilariously, I met him again last summer here in the Ocean State, and nothing much had changed). This is useful advice for someone stuck in the doldrums of late winter New England. It was late January when I got some disappointing news and set off to cure my blues at the fabric store. There’s a bodice in the plaid underway for another silk gown (eventually to be sold, I think; how many can one have? ), but I grew dissatisfied with the fabric. Too pale. I wanted More Color. Brighter Color. Lucky for me, it was on sale. Fabric Mart Fabrics has been good for me in the past, and a silk sale was a success this time, too. The bright and bold dress in the FIT collection was my inspiration, and I dearly hoped I would not manage to cut the cross-barred pattern to match, so of course I pretty much did. 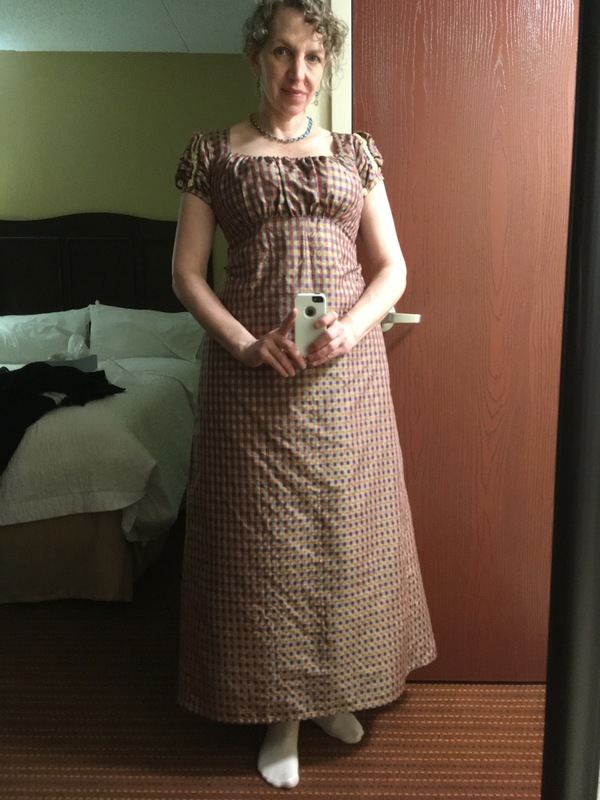 My tried-and-true pattern based on the 1815 roller print gown at Genesee Country Village was the base pattern for the silk gown: I know how to adjust it so that I can get dressed on my own, drawstrings the saving grace for the solitary woman who wants a back-closing gown. But the dress, that’s the point. 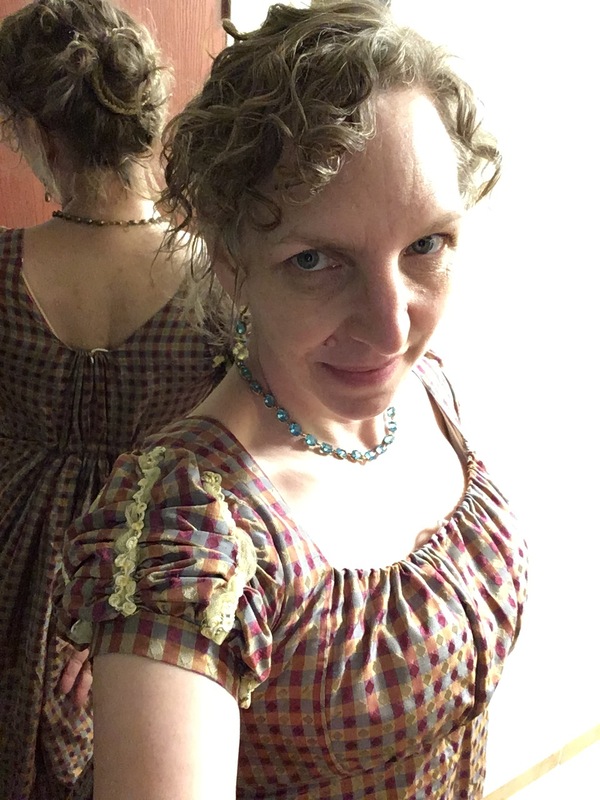 It’s done, at least enough to wear, though I did not buy enough trim for the hem and will have to trek back up to Natick for another few yards with which I can trim the hem. A lovely young woman named Tanya did get a photo of me in full regalia, down to the gloves (yes! leather opera gloves!) but I haven’t found it yet out on the interwebs, so my hotel room selfies must suffice. What I find most satisfying– aside from the dancing– is how versatile a very simple dress pattern can be. Fabric choices, trims, hem length, minor sleeve alterations, and accessories make this one pattern work both for a day dress and a dancing dress.